U.S. Air Force officials are moving to reconfigure the GPS constellation to create a 27-satellite geometry that will improve the availability and accuracy of positioning, navigation, and timing (PNT) capabilities for U.S. military forces in Afghanistan and Iraq. According to studies by an independent review team (IRT), a true 27-satellite constellation could substantially reduce the outages in 3-D positioning capability experienced by allied forces in mountainous Afghanistan. 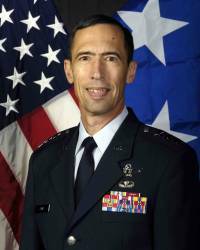 The proposal was raised in a presentation to the National Space-Based PNT Advisory Board on November 5 by Lt. Gen. Larry D. James, commander of 14th Air Force (Air Forces Strategic), Air Force Space Command (AFSC), and the Joint Functional Component Command (JFCC) for Space, U.S. Strategic Command (STRATCOM), at Vandenberg Air Force Base. A decision to move ahead with transitioning the constellation to could come within a matter of weeks, pending a briefing to and approval of the proposal by Gen. Kevin Chilton STRATCOM’s commander, who is responsible for the global command and control of U.S. strategic forces including GPS. An announcement probably will not come at next week’s meeting of the National Space-Based PNT Executive Committee meeting, but the plan only needs Chilton’s authorization to be put into effect. Repositioning the satellites into a 27-SV formation reportedly would take about six months and would be implemented by the 2nd Space Operations Squadron at Schriever Air Force Base, Colorado. The idea of expanding the constellation has been around for many years. More than a decade ago, the Air Force GPS Modernization Acquisition Master Plan (AMP) made a preliminary recommendation to expand the GPS constellation to 30 satellites. And a 2005 Defense Science Board Task Force on GPS reiterated that position. But the concept has gained greater urgency as U.S. air sorties and ground troops use GPS to target adversaries in the steep Afghan terrain where satellite signals are frequently blocked by 45- to 60-degree hillside slopes. Reportedly, Air Force calculations of availability of GPS PNT on a global basis do not take into consideration local terrain features and assume only a five-degree masking angle for satellite-receiver visibility. Current GPS interface specifications would support operation of a 27-satellite constellation, although a 30-SV level would apparently require those specifications to be redrafted. The current operational control segment can handle up to 31 satellites and the next-generation system (OCX) will be able to operate many more. The Obama administration and Gen. Stanley McChrystal, commander of NATO troops fighting Taliban and Al-Qaeda forces in Afghanistan, have set the goal of reducing fratricide and inadvertent civilian casualties there. The deterioration in available GPS position dilution of precision (PDOP) accuracies has forced operational changes in air and ground operations to avoid such casualties. Resistance to managing a 27-satellite geometry have arisen from officials concerned that such an effort would commit them to sustaining that level as a requirement without adequate resources to sustain the effort. Others have argued that the emergence of new GNSS systems such as Europe’s Galileo will greatly expand signal availability without the need for additional investment in GPS. While that might meet civil and commercial needs, however, the sovereign needs of maintaining a critical national infrastructure can probably not be met by relying on assets not under direct U.S. control. Better satellite geometry achieved by managing for a 27-SV constellation would also benefit the needs of homeland security and other critical applications in U.S. urban centers and other signal-challenged environments. The constellation management proposal also needs to devise a plan for transitioning back to a 24-SV configuration in case a shortfall occurs in the number of on-orbit satellites.